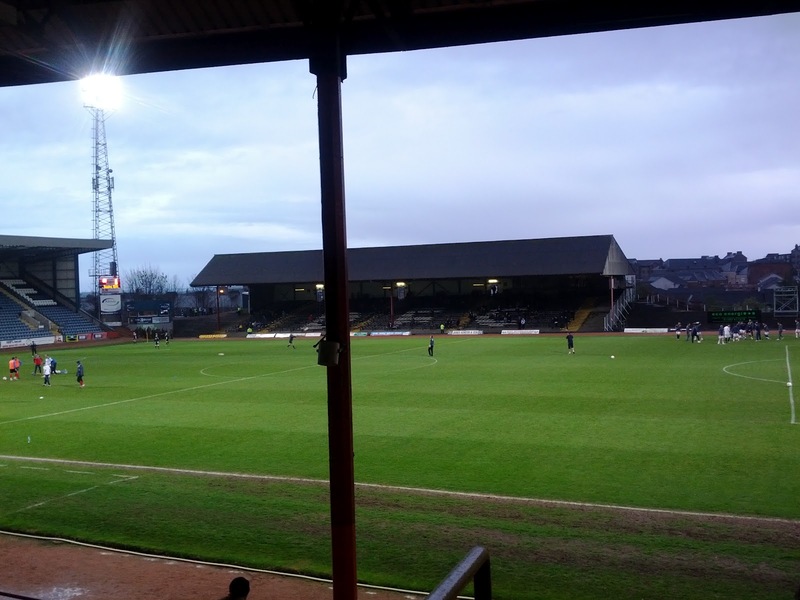 When you hear the words Dundee Football Club, what are the first images that come into your head? St Johnstone, Dundee United and Raith fans...you aren't allowed to answer that question. I've heard enough of your chat on this matter! Someone who also played for Dundee at that time was Barry Smith, now manager of the Tayside club. Smith is a bit of a legend at the club after 11 years there as a player and what is now, a quite successful full season in charge as manager. Aye...that's all good and well Barry but what sort of supporter experience does your club offer?! 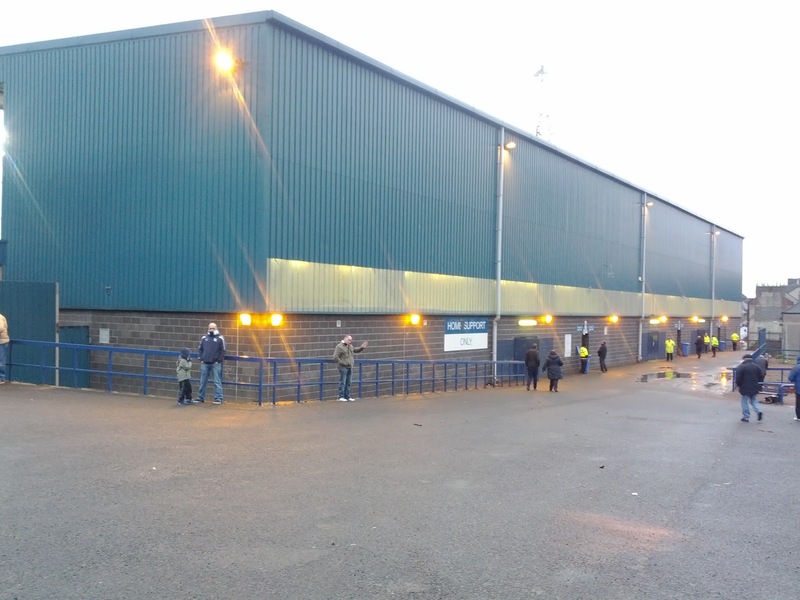 I didn't experience anything particularly new when arriving at Dens. Not only have I been before (just never in the home end) but I walked past it only a month ago for when I covered Dundee United on OTWRB duty. The stadium itself those, is a true mixture of old and new. Behind each goal sit single-tiered modern stands (the Bill Shankly and Bobby Cox) while the side stands couldn't be further from modern. The South Stand is a crazy little stand which only runs for about two-thirds of the pitch and has supporting pillars and the restricted view that comes therewith. The Main Stand, which is where I sat, is also completely nuts in that although seated and covered, it is unusually oval in shape with minimal seating in the lower tier. Overall, quite good surroundings in which to watch football. 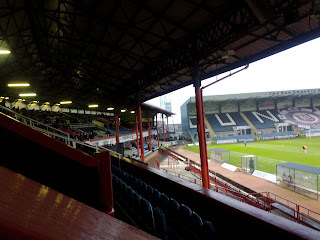 The seats in the Main Stand appeared to be made for midgets - comfort levels were low - although the quirks of the shapes of the two older stands and mixture of old and new means that Dens scores modestly in this category. The first thing I should say about the catering in the Main Stand at Dens is that you simply cannot miss it. 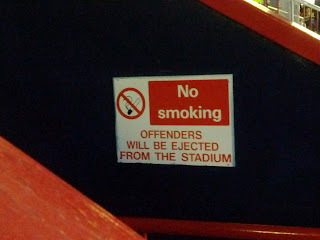 I entered the turnstile and was immediately faced with a "Help you mate?" from the wee man behind a counter which sits just inside the entrance. So I replied....."Why yes, kind sir....".........in my head and then remembered I was in Dundee and that would get me a shoeing (cheap shot, I know! I love Dundee really!) so said "Aye man. Pie and a tea please". I wasn't expecting his "£4.20 please pal" though! Absolute disgrace in my opinion. People know what's in a pie right? Mashed up bits of dead man's leg and a thin pastry outer. £2.20! Shambles! Anyway, I grudgingly bought the two items and took them upstairs. Raging, I took a bite and for a minute (just a minute) I felt vindicated for spending that money. Pie was superb. Tea was cracking. Boom! Fed! I've never really had a great deal to do with Dundee fans. 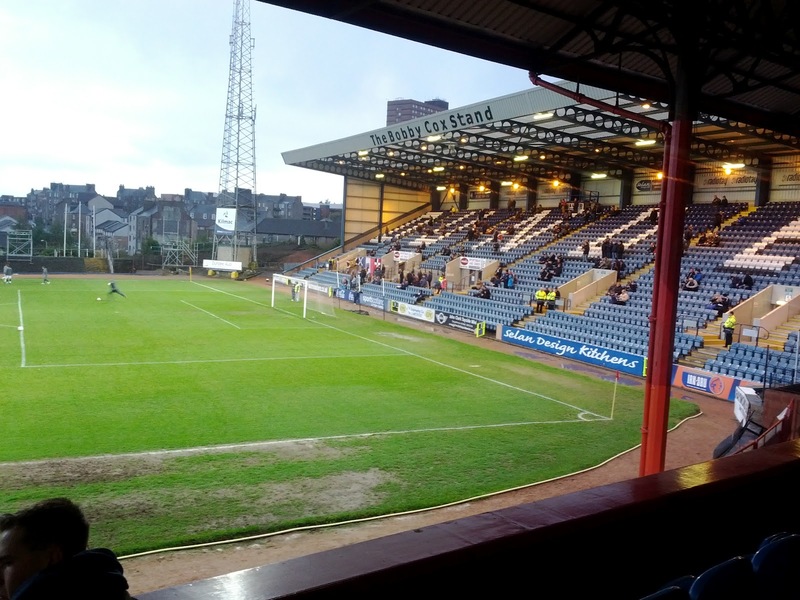 With the exception of a friend of mine who is a Dark Blue's fan, and he's a one off, this was the first time in my puff I'd ever physically sat with the Dens Park faithful. Not everyone sat, mind you. Some stood down the front where the wheelchairs were meant to be. Which was a bit random. They stand where they wa-aaa-aaant...Dundee supporter...they stand where they want! On the whole though, I would say they were a pretty well-behaved lot. There were pockets who tried a bit harder than others to get everyone else enthused. There were some who just weren't particularly up for it on what was a freezing cold April night when there was, let's face it, very little to play for. That said, at no time did they fall into the Falkirk trap - fans simply giving up and not watching the game, talking about other teams etc. They were a well-engaged lot, quite welcoming of a newbie and quite sporting - acknowledging that Queens actually deserved their point, for instance. I found this section of this post the trickiest of all. 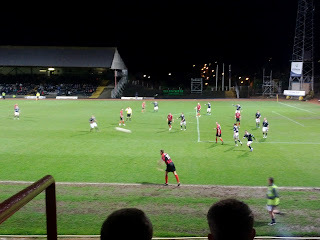 Dundee played some nice football at times, they are quite a dynamic side. They keep ball well. They aren't scared to go backwards when need be and, there seems to be a lot of very good movement up front and in the wide positions. There was just something that didn't quite click on the night. They were just half a yard off the pace. Passes were just marginally misplaced and, on the whole, they simply didn't match the desire of their visitors who, to be fair, are fighting for their lives so did have more to play for. 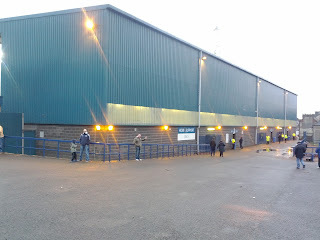 Overall, Dundee didn't play that badly, but I did expect more and I got the general feeling from those around me that they were pretty poor on the night. Some very decent players in there though. Ryan Conroy: Cultured left foot, happy to go outside or come inside and with a very good final ball, I like this boy. He covered back well, protecting Gary Irvine and seems to have a good understanding with those inside him. Had a good game. Jamie McCluskey: Not usually my kind of player (a jinky, wee winger) I felt he played pretty well. He seemed to run out of steam around the 70 minute mark but until then he was involved in everything good Dundee did. Linking well with Steven Milne up top in particular, he added creativity and drive to an otherwise lacklustre home display. 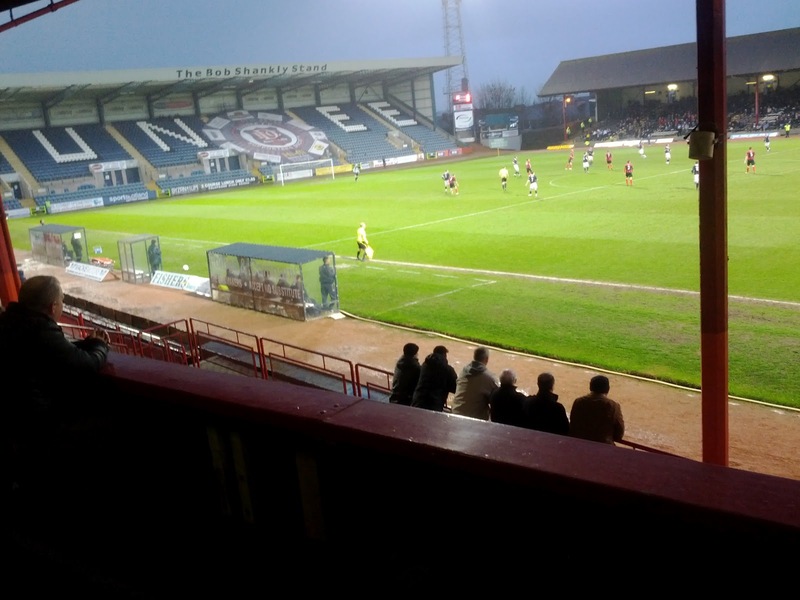 With all that said, Dundee, like Forfar, get pass marks but aren't near the top end of the scale. The food is excellent, but is extortionate and, when you factor in a £19 entrance fee, Dens Park can be quite an expensive day out for Division One football. 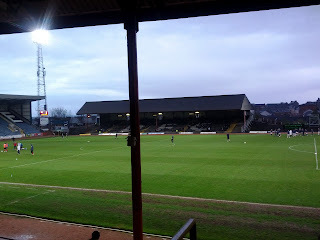 The quality on the pitch on this occasion certainly didn't justify the fee and therefore I'd have to say that there are probably better places to go watch footie than at Dens. Nonetheless, if you are in Dundee, are looking for a game to go to and United aren't playing at home (much better option in my opinion...sorry Dees!) 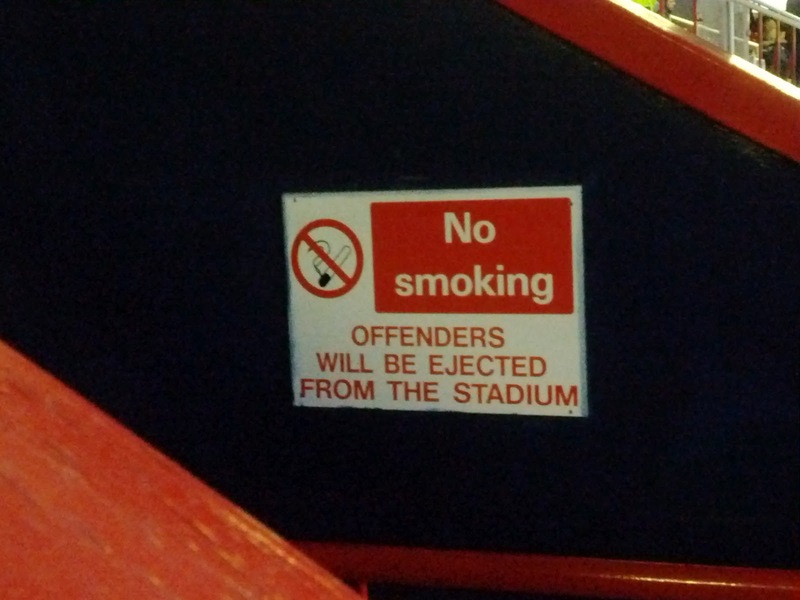 then go along to Dens. Maybe eat before you get there though....for £3.99 you can get a Wetherspoon's burger and pint for god sake!